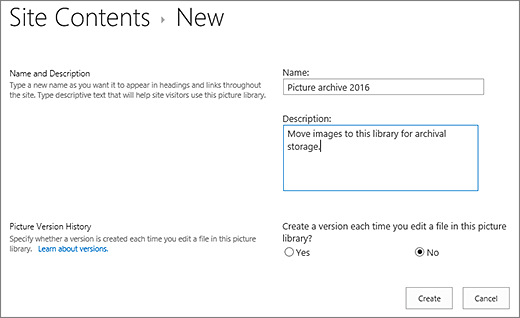 Create a document library in SharePoint Online or SharePoint Server 2019, 2016, 2013, 2010, or 2007 to securely store files where you and your co-workers can find them easily, work on them together, and access them from any device at any time. 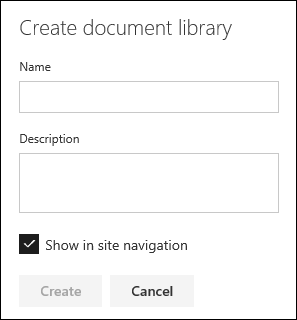 SharePoint team sites include a document library by default, however, you can add additional document and other libraries to a site as needed. For more information about document libraries, see What is a document library? 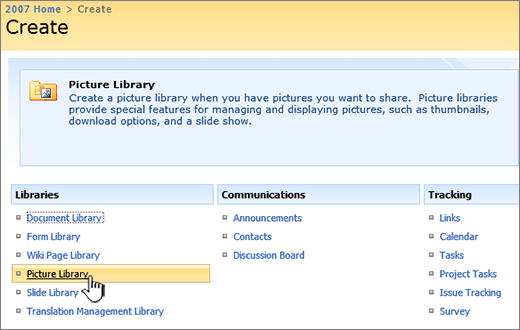 To delete a library, see Delete a document library in SharePoint. Note: To create or delete a library, you must have permission to create or manage lists. Go to the team site where you want to create a new document library. On the menu bar, click New and then click Document library. For other types of libraries, click App, and choose the library you want to create. In the Create document library pane, type a name for the new document library and, add an optional description. 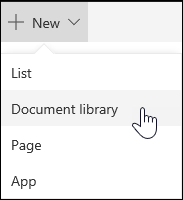 If you want to add a link to the new document library in the left-hand navigation for the site, select Show in site navigation. This option is selected by default. 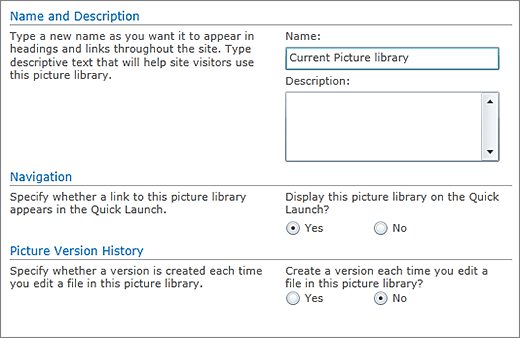 Click Create to create your new document library or click Cancel to return to the team site. 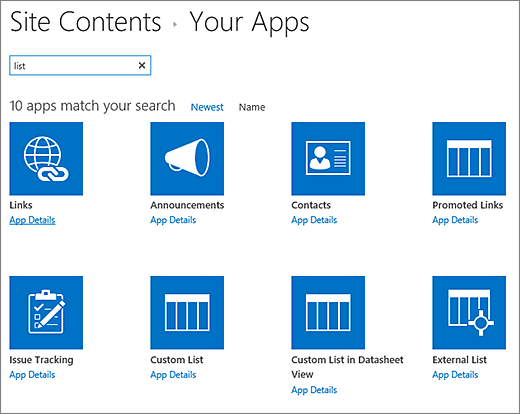 For info on adding versioning, uploading files, and enabling other library features, see Next steps with your document library. Click the library type you want (document, form, picture, etc). If you don't see the one you want, type a keyword into the search box and press search . Type a title into Name field. You can also click Advanced Options and enter a Description. Depending on the type of library, you can add versioning and other features. Click Site Actions , click View All Site Content, and then click Create . 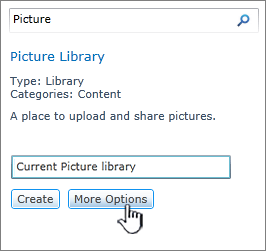 Under Libraries, click the type of library that you want, such as Document Library or Picture Library. Enter a description into the Description box. The description is optional. The description appears at the top of the library page, underneath the name of the library. If you plan to enable the library to receive content by e-mail, you can add the e-mail address of the library to its description, so that people can easily find it. Some libraries support the integration of incoming e-mail. If an Incoming E-mail section appears, your administrator has enabled your site to receive content by e-mail. If you want people to add files to the library by sending them as attachments to e-mail messages, click Yes. Then, in the E-mail address box, type the first part of the address that you want people to use for the library. To create a version each time a file is checked into the library, in the Document Version History or Picture Version History section, click Yes. You can later choose whether you want to store both major and minor versions and how many versions of each you want to track. 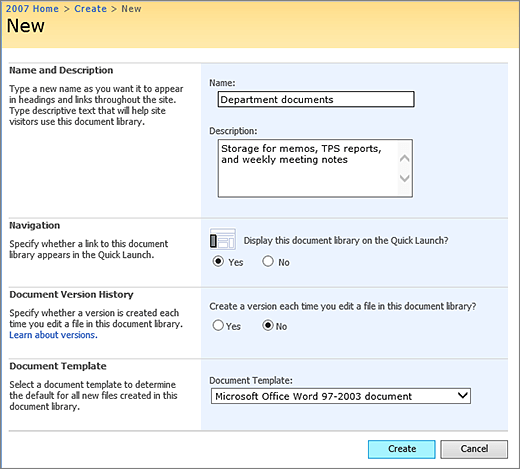 For some libraries, a Document Template section may be available, which lists the default programs for creating new files. In the Document Template section, in the drop-down list, click the type of default file that you want to be used as a template for files that are created in the library. Note: If content types are enabled, the default template is specified through the content type. If multiple content types are enabled, you can choose from different default file types when you create new files. In this case, the default file types are specified by the content types instead of the Document Template section when you create the library. Click Site Actions , click View All Site Content, and then click Create on the All Site Content page. Under Libraries, click the type of library that you want, such as Document Library. If an Incoming E-mail section appears, your administrator has enabled your site to receive content by e-mail. If you want people to add files to the library by sending them as attachments to e-mail messages, click Yes. Then, in the E-mail address box, type the first part of the address that you want people to use for the library. Depending on the type of library you are creating, a Document Template section may be available, which lists the compatible programs that are available as the default for creating new files. If content types are enabled, the default template is specified through the content type. In the Document Template section, in the drop-down list, click the type of default file that you want to be used as a template for files that are created in the library.